There is an amazing man behind the creation of this resort. 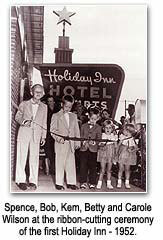 His name is Kemmons Wilson, the same man who created the very popular Holiday Inn Hotels. His is a rags-to-riches story if you have ever heard one. Kemmons Wilson was raised by a single mother who told him at a very young age, that he could do anything that he put his mind to, and she drilled it into his head so hard that he finally decided that he could. He went from selling copies of The Saturday Evening Post for a nickel when he was six years old, to selling popcorn outside of a movie theatre at the age of 17 (the first to come up with that idea). As an adult he tried several different ventures including selling pinball machines, owning theatres and an ice cream store, having a vending machine business and purchasing a lot of real estate. One year while he and his family were on vacation, they were having trouble finding accommodations that were suited to everyone in the family. During this vacation, he made a decision that eventually led to the development of the Holiday Inn hotel chain, which opened in 1952, and later, the Orange Lake Resort in Kissimmee, FL which opened in 1982. Mr. Wilson (seen here with his wife and grown children) built all of his companies, including Orange Lake, on a foundation of solid values---trustworthiness, dependability and customer focus. And those are not just words. When you visit this vacation resort in Kissimmee you will see these values demonstrated over and over again. In the way that you are treated by the staff, in the appearance of your villa and in the the way the grounds look (absolutely impeccable, always). Everything about this place breathes those values. It is hard to find a flaw anywhere. And they are constantly making improvements to the property so it never looks aged like some resorts do. They really do all they can to maintain the property and there is a lot to maintain! If you are considering a vacation in Kissimmee, you really should check out this fantastic resort. It is a timeshare resort but you do not have to be an owner to stay there. Among the group of friends that we travel with, only 5 of the 14 families are owners. That just means they get first dibs on accommodations and receive discounts in all of the Orange Lake stores and restaurants. Each section is really set up to be stand alone. If, for example, you are staying at the East Village, there are restaurants, pools, tennis and golf right in your own area. We have found that part of the joy of going to such a big vacation resort is venturing out of your section and really taking advantage of the entire resort. One day we might meet up at the West Village pool area, shop and hang out there for a while, then head over to North Village and have lunch. There is so much to choose from! After one visit, we were hooked. This was not like other vacations to Kissimmee and Orlando we had previously experienced (cramped accommodations and hectic environment). We ended up buying a week per year at the resort and have enjoyed a 3 bedroom luxurious villa in the East Village every year since then. When I say that these vacation villas are over the top, I am not kidding. 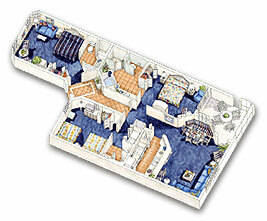 Check out the layout of their 3 bedroom villas. 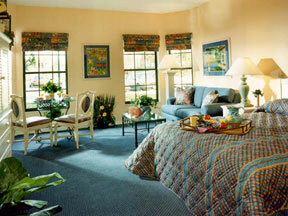 There are 2 master suites, which makes it perfect for 2 families, or one family with grown children. Each 3 bedroom villa sleeps 12. One master has a king and full bathroom with a spa tub and shower and the other master has a queen bed, a sitting area and bathroom with shower. The 3rd bedroom has 2 queen beds and is right next to the hall bath which also has a shower. Yes, that is 3 bathrooms! To give you an idea of how nice they are, here is a picture of the front master bedroom. Each vacation villa also has a full size kitchen with everything you could possibly need to host a party. The living area has a pull out sofa bed, a TV and VCR and a bar with stools. The dining area has a table for eating and playing cards. Many games of Poker and Uno have been played on those dining tables around the resort! Oh, I almost forgot. There is a full size washer and dryer in each suite so you can pack lightly. Really handy. The first year my family vacationed at Orange Lake, we did so on what is called an Orange Lake Referral. One of my owner friends invited us to visit under their name and we were able to try out the resort at a substantially reduced cost as long as we attended a 2 hour presentation (free breakfast included) about timeshare ownership. A very small price to pay indeed! If you are interested in a vacation in Kissimmee, you can visit Orange Lake under my name using their referral program. To take advantage of this vacation in Kissimmee opportunity, complete my Orange Lake Referral Form. Specials are offered all the time allowing you to visit at substantially reduced prices. NOTE: This is an extremely popular Kissimmee Florida vacation resort because of its top notch accommodations and amenities. And its location can not be beaten. Did I mention that it backs up to the Disney Animal Kingdom and that you can watch the Epcot Fireworks every night from your Orange Lake balcony? I can not stress enough how important it is to make reservations for your vacation in Kissimmee well in advance. I suggest at least 6 months, if possible. You will not regret it. I have a morning ritual when I am at Orange Lake. Each 3 bedroom villa has a screened-in porch (you can see it in the upper right corner of the layout) and ours overlooks one of the 4 golf courses called The Legends which is an Arnold Palmer designed course. I like to get up early in the morning, grab a cup of coffee and head out to the porch. There are always golfers quietly strolling by and occasionally you will see wildlife, especially birds, that inhabit the area. It is peaceful, lush, smells like freshly cut grass and is warm with sunshine. Coming from Illinois in March, you can not beat my morning ritual. It is heavenly! After a nice relaxing morning, the toughest decision I have to make is what I want to do for the day. Visit the parks in the Orlando area? Golf? Tennis? Hang by the pool and drink Pina Coladas? It is so easy to get into vacation mode (and hard to get out of it!) when this is the toughest decision you have to make each day. 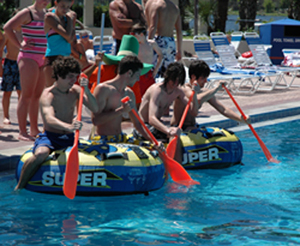 There is something for everyone at and around the Orange Lake Resort in Kissimmee, Florida. In our group of families that vacation together, people range in age from 2 years old to 80 years old. I am sure at least one person from our group has used every single amenity that Orange Lake has to offer. In fact, there is so much to do on the premises, you do not even have to leave the resort if you do not want to. The guys (and a few of the ladies) spend a lot of their vacation time on the golf courses either in Orlando, Kissimmee or at Orange Lake. There are 4 to choose from on the property and each one is challenging and unique. For detailed course information including maps, hole yardage and descriptions, visit the Orange Lake Golf Course webpage. There are so many golf courses in the Kissimmee and Orlando areas and Orange Lake has some of the best. During the day when our kids are not in a pool, they often spend their vacation time on the mini golf courses at Orange Lake. At night, we all play and have even had tournaments. In the West Village, you'll find 36 holes of golf. Choose from the Fountain Course or the Magnolia Course, or play both! Orange Lake has hosted the Professional Putters Association National Championship, which aired on ESPN. The PPA National Championship draws more than 100 professional putters from around the United States and from other countries such as Australia and Japan to compete for more than $65,000 in prize money. There is also another 36 holes at River Island. Their mini golf courses are just one more reason to check out Orange Lake when planning your vacation in Kissimmee. I can not say enough about the pools at Orange Lake. As I mentioned before, there are pools in each of the sections. The East Village has a pool area that is smaller and pretty quiet, perfect for reading peacefully in the sunshine while the North Village has "Splash Lagoon" complete with waterfalls and slides. In the West Village area there are 3 pools: A really great zero depth pool with water fountains for little kids, a medium size heated pool and a larger, unheated pool for doing laps and having Pool Races. That is where 2 people get into a big inner tube with paddles and race their opponents down to the end of the lap pool and back. It is hilarious to watch! The West pool area is also where you go if you want to play Bingo in the afternoon which is a huge hit among my group of friends. Every day around 1 or 2:00, Bingo begins. Some people think that Bingo is a game for old folks (me being one of them at first) but not at Orange Lake. Everybody plays! You are supposed to be 18 to play because it really is gambling, but our kids still help us watch our cards. Pretty decent jackpots are given out, like $250 at a shot. A couple of people in our group have won over the years. And last, but certainly not least, is the brand new River Island which opened in 2007. This complex alone, makes this resort one of the best vacations in Kissimmee available today. All I can say is "Wow!" The pool area is simply amazing. There are slides, bridges and waterfalls and flowers everywhere. Plus there is a pool at each end, one of them being zero depth for the little ones, and a beautiful spa. But my favorite part of River Island by far is the lazy river. The first and last pictures below are of Orange Lake's North Village pool area and the one in the middle is a small part of River Island. Our vacation days are spent basking in the sun on a lawn chair, gently rolling passed waterfalls and gorgeous flowers in an inner tube, taking turns going down water slides and then warming up in the sun with a Pina Colada. And the next day, we get up and do it all over again! There are nice little patio areas surrounding the pools where you can just sit and read or watch the people float by. At the entrance of River Island, you will find a 30,000 square-foot clubhouse featuring food, fun and activities. Inside is the River Island Grilling Company restaurant and Tradewinds bar, Island Traders convenience store, Currents Cafe brewing Starbucks® coffee, Connections Business Center & Internet Cafe, Mussels fitness center and the Tickets & Transportation desk where you can buy tickets to attractions in Orlando and Kissimmee. There are so many pool areas to choose from at the Orange Lake Resort. They all have their own flair and uniqueness. I say, why not try them all like we do when we are on vacation in Kissimmee? You will find several different restaurants throughout the resort, from poolside casual to country club spectacular. The newest ones are at River Island as mentioned above. You can read about some of the Orange Lake Restaurants here. So how do we spend our evenings at Orange Lake? The adults usually gather in one of the resort restaurants for dinner then head over to somebody's villa for a party. 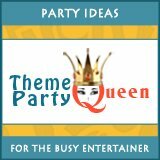 One night we had an Hawaiian theme party where we dressed up in Hawaiian outfits, drank foo-fee drinks, like Pineapple Bleus and Limoncello Mint Lemonade and played "Name that Tune." The losers had to do a congo line dance around the room. Resort Security was called because we were laughing so loud and our kids got quite a kick out of the fact that the adults got in trouble. 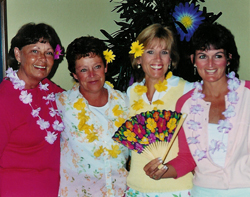 We have also had Wine Tasting Parties and Bunco Theme Parties while on vacation at Orange Lake. Most of the kids are old enough now to do their own thing so they usually gather at a villa and play games or head down to one of the club houses for pizza. For vacation activities, they can choose to play nightime putt-putt golf, visit the 3 video arcades or play ping pong, just to name a few. One of the most helpful services that Orange Lake offers is free bus transportation throughout the resort so it is easy for kids to get around. At first, I was hesitant to allow my teenage daughter to ride the bus around the resort with only her friends, but once I arrived and got a feel for how safe it is, I immediately relaxed. They also provide transportation to all of the major attractions in the Kissimmee and Orlando areas with buses leaving from the resort several times a day. above, you should end up with a very good idea of how truly special this vacation resort is. 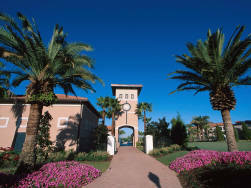 When planning your vacation in Kissimmee, don't forget about the Orange Lake Country Club and Resort. As my friend did for me, I offer you the opportunity to visit Kissimmee using the Orange Lake Referral program under my name. To take advantage of this opportunity to vacation in Kissimmee, complete my Orange Lake Referral Form. Specials are offered all the time allowing you to visit at substantially reduced prices. REMEMBER: This is an extremely popular resort in Kissimmee because of its top notch accommodations and amenities. And its location can not be beaten. Make your reservations early to ensure that your vacation in Kissimmee is set! We have vacationed at Orange Lake so many times now that our group has settled into a comfortable routine. The weekly rentals start and end on weekends so we usually spend all of our vacation time at the resort and reserve Wednesday of our vacation week to venture off site. It has become a tradition to visit parks in the area during the day on Wednesday. Disney is a 10 minute drive from Orange Lake and Universal Studios and Sea World is about 20 minutes away. Over the years, I think we have hit them all. The younger kids tend to really enjoy Disney's Magic Kingdom, Animal Kingdom and Blizzard Beach. The teenagers go for Islands of Adventure, Sea World and MGM Studios while the parents and grandparents really enjoy Epcot and Universal Studios. Pat Obriens, Home of the "Hurricane" cocktail. They have a really nice outdoor dining area, good food and great drinks. 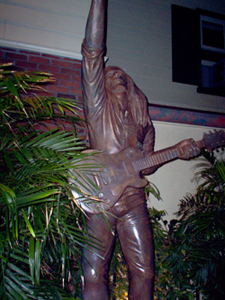 There is a Bob Marley bar/restaurant there and it is always a hit but you will need reservations and ESPN Zone has great food and is reasonably priced. The kids love to walk around the shops, get their hair braided and get fake tattoos. Of course, I have only mentioned a few of the things you can do in the Orlando area. For more information on Vacations in Kissimmee and Orlando Activities, click here. My family has enjoyed several vacations in Kissimmee at the Orange Lake Resort and I can honestly say we have created very special memories that will last a lifetime. 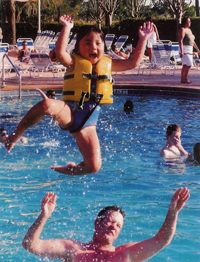 These years at Orange Lake have been the best vacations in Kissimmee we have ever had. We even made a scrapbook and gave copies to all of our friends who shared the 2004 Kissimmee vacation with us. 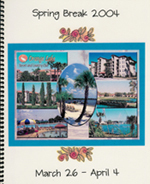 If you would like to learn how to make a handmade scrapbook like this one so you can document your vacation in Kissimmee, Florida, go to my Pictures/Scrapbooks webpage and click on the Handmade Scrapbooks Quick Jump Link at the top of the page for step by step instructions. My hope is that you will decide to vacation in Kissimmee, and if you do, I encourage you to try Orange Lake. I can personally assure you that you will create some of the most precious vacation memories for you and your family. One of the premier party destinations is Chicago. Find useful tips on what to do, where to stay, top restaurants and everything else you need to know before visiting this beautiful Midwestern city.